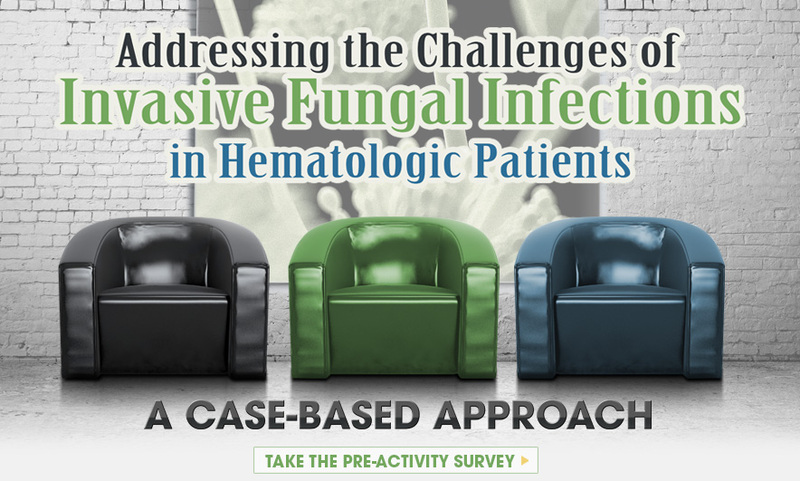 Over the past decade, the increasing numbers of patients with hematologic malignancies, the development of promising diagnostic techniques, and an expansion in the number of antifungals have been associated with the diversification of strategies for the prevention and treatment of invasive fungal infections (IFIs). Despite these advances, IFIs continue to be a major cause of morbidity and mortality among patients with hematologic malignancies. Early detection and diagnosis of IFIs have been shown to significantly impact survival. The fact that clinical symptoms for IFIs are not specific and are usually not apparent until the late stages of infection constitutes a major challenge. Not only do clinicians have access to improved diagnostic techniques, but the antifungal armamentarium has been expanded, providing more potent and better tolerated options when selecting treatment. With the availability of newer agents comes the responsibility of using these agents appropriately, taking into account patient and pathogen factors. Historically, antifungal agents have been associated with tolerability issues and drug-drug interactions. This is of great concern when treating patients with hematologic malignancies or HSCT recipients due to the number of concomitant medications typically used in this patient population. The development of better tolerated antifungal agents has led to the expanded use of antifungal prophylaxis in high-risk patients. Prophylaxis has been shown to offer significant benefits for different patient populations. However, the consequences of the increased use of antifungals are now becoming apparent. Patient-centered approaches that take into consideration host-, pathogen-, and drug-related factors are critical in attaining optimal clinical outcomes. In the absence of consensus management guidelines, the choice of antifungal therapy to prevent and manage IFIs in patients with hematologic malignancies and HSCT recipients varies widely from center to center. Effective management of IFIs will rest ultimately in best evidence practices and research focused on understanding, preventing, and controlling fungal infections. This activity meets the educational needs of hematologists, medical oncologists, clinical pharmacists, advanced practice oncology nurses and oncology physician assistants involved in the care of patients with hematologic malignancies at risk for or with invasive fungal infections. Through a case-based approach, this online activity is designed to enhance attendees’ awareness and knowledge of the latest advancements and clinical findings in managing IFIs in patients with hematologic malignancies so that they may improve individual performance and patient care. Center designates this live activity for a maximum of 2.0 AMA PRA Category 1 Credit(s)™. Physicians should claim only the credit commensurate with the extent of their participation in the activity. Dr. Marr does not discuss the off-label use of a product. Dr. Pappas does not discuss the off-label use of a product. Dr. Patterson does not discuss the off-label use of a product. By clicking on an Episode below, I acknowledge that I have read the entire CME/CPE information.